This course was designed to assist Law Enforcement, and Military personnel with the ability to conduct Use of Force Training utilizing the Force on Force® less-lethal training ammunition and RedMan® protective gear. This training will prepare instructors to provide safe and realistic training by understanding the correct application of Force. By utilizing Force on Force less-lethal cartridge and RedMan protective gear for all scenarios from No shoot, hands-on, and lethal force. Topics include: conduct use of force training with Force-on-Force Marking Cartridges, design and conduct Isolation Drills using RedMan and Force on Force Marking Cartridges, train role-players to safely enhance training and reduce injuries, reduce risk with triple check safety rules, and select and safely manage temporary training locations. Pistol and rifle (converted marking cartridge firearm). If the participant’s agency is unable to provide this training equipment, the necessary equipment will be provided, however the student may not be issued a training weapon similar to their duty weapon. Certified protective gear for force-on-force training, duty belt (or tactical vest) with all issued gear (body armor, flashlight, handcuffs with key. wraparound eye protection), participants should come prepared to train in all weather conditions and should bring a hydration system or water bottle, participants should wear clothing suitable for training, but similar to garments worn while working, participants are advised to wear long-sleeve shirts, all RedMan protective gear and Force-on-Force ammunition will be provided. Raymond A. Merlin served In the United States Marine Corps for 4 years in security forces and infantry and has over 26 years with the Kenosha County Sheriff’s Department (WI). He worked the most of his career on 3rd shift patrol and was a 20-year member of the Tactical Response Team. Ray has a Bachelor’s Degree in Criminal Justice and Minor in Human Resource from Concordia University and is a Master instructor-trainer in Defense and Arrest Tactics, Principles of Subject Control, Firearms, Professional Communications, and Scenario Master Instructor. Ray serves on Advisory committees for the State of Wisconsin Training and Standards and is currently on the Tactical Advisory Committee for the State DOJ Training and Standards. Ray is a ILEETA Advisory Board member, an adjunct instructor and training coordinator for LE Training Division at Gateway Technical College, WI. Ray is an expert witness in Use of Force and Subject Control. No one brings a knife to a gunfight. So why match non-superior firepower with the equivalent? In this clinic, Law Enforcement Officers will be instructed and instilled with the confidence of employing their patrol rifles effectively. This course will demonstrate the capabilities and advantages of using a patrol rifle and students will understand the force multiplier concept. Not only will Law Enforcement Officers have a better understanding of this weapon system and how to utilize it, they will also develop and fine tune their skill set to effectively educate their respective departments. 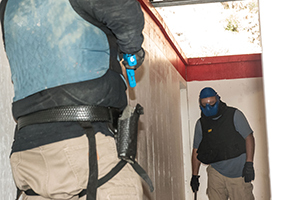 This clinic covers the real-world application of this weapon system and utilizes training methods practiced by both Military and Law Enforcement alike. Rick’s delivery and combined experience with his military & law enforcement backgrounds, bring new practices and ways to train effectively for the unknown environment we operate in daily. This will be a demanding class taught by the informal lecture method that is both round intensive and participant driven. Topics covered will include: Effective employment from cruiser & sling, effective engagements, close quarter engagements, effective zeros, patrol rifle fundamentals, types of reloads, multi target engagements, transitions from rifle to pistol, malfunctions, combat mindset, forward and aft movement, lateral movement, use of cover, mechanical offsets, shooting positions, after actions assessment. Eye and ear protection, brimmed hat, patrol rifle, rifle sling, 600 rounds of rifle ammunition, at least 3 rifle magazines, at least 1 method of rifle mag retention, patrol pistol, duty belt and holster, 200 rounds pistol ammunition, at least 2 methods of pistol mag retention. Rick has dedicated his entire professional career to service for his country. Prior to Law Enforcement, Rick spent 8 years in The United States Marine Corps, as an infantry Marine and Scout Sniper Team Leader. Rick deployed 3 times in support of Operation Iraqi Freedom and Operation Enduring Freedom. After separating from the Corps, he then pursued a career in Law Enforcement. Currently while serving in Law Enforcement, Rick is a City Police Officer and a state certified Law Enforcement Firearms instructor. 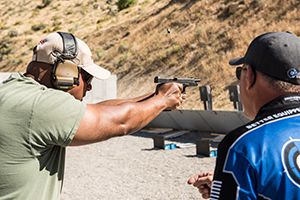 Rick trains all levels of firearms training to Law Enforcement Officers and uses his training and experience, combined with continued learning to instruct his students. This advanced fast-paced, dynamic & highly interactive workshop is based on the two-day Counter Ambush Skills & Tactics (CAST) course. It is specifically designed for the officer on the street who requires an enhanced knowledge of skills and tactics to mitigate an ambush assault situation. It provides, in detail, aspects of the ambush assault, situation & confrontation awareness, combining relevant skills and tactics. Additionally, this course is designed to provide a solid understanding of dynamic movement, team/individual tactics, vehicle-based tactics and force application. Students will also learn acceptable and legally defendable methods of subject control, use of force, and weapons manipulation. Practical application exercises are combined with stimulus/response conditioning principals and the development of a winning mindset. This IS NOT a basic shooting program, students failing to meet and maintain our safety requirements and/or who cannot meet and immediately demonstrate the minimum skills required for the specific program may be removed from training. NOTE: This CAST workshop has a force-on-force training component, so come prepared. Handgun, holster, magazine carrier and a minimum of 3 magazines, at least 350 rounds of handgun ammunition, eye and hearing protection, knee pads and gloves are highly recommended, long sleeve shirt or similar garment for force on force drills. Dr. Wes Doss is an internationally recognized firearm, tactics and use of force instructor with over 30 years of military & civilian criminal justice experience, as well as significant operational time with both military & law enforcement tactical operations & protective service organizations. 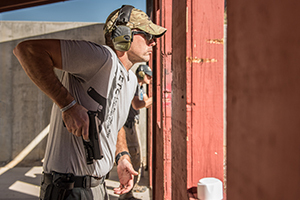 Wes holds specialized instructor certifications from the U.S. Army, the U.S. Marine Corps, Arizona POST, the Smith & Wesson Academy, the Sig Sauer Academy, NRA LEAD, FEMA and the Department of State. Wes holds a Master’s degree in criminal Justice Administration and an upper level Doctorate in Psychology, with an emphasis on sports and performance psychology. Shooting on the reactive steel bobber range will push your skills to the limit. This course will demonstrate that a properly prepared officer can execute accurate shots in exceptionally short time windows, including less than one second. This course is not a “quick draw” session, but rather a session designed to reveal your real capabilities in drawing, accuracy, speed, and magazine changes. No matter how fast and accurate you are now, this course will make you better. Issue sidearm and holster (concealed drawing is not allowed in this course), 800 rounds of handgun ammunition (frangible is preferred for maximum safety, but non-frangible is acceptable), wrap around eyewear, brimmed hat, hearing protection. Todd Haller is a Patrol Sergeant with the Snowmass Village Police Department (22 years). He is the training director of a regional multi-agency law enforcement firearms/Use of Force/arrest control/driving training program for agencies in south central Colorado. 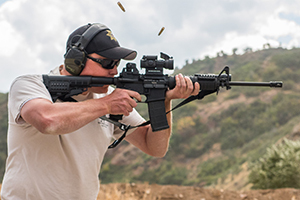 Todd is the lead POST firearms instructor for the Colorado Law Enforcement Training Academy (CLETA) at Colorado Mountain College, Glenwood Springs, CO. His firearms instructional skills and knowledge are in demand nationwide. 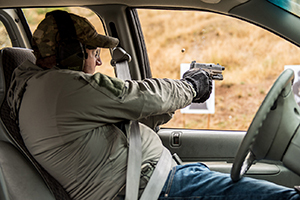 Todd has taught basic to advanced handgun skills for Executive Security International, Safariland Shooting School, and the Action Target Law Enforcement Training Camp. This class will take you and your patrol rifle beyond what you may have thought possible. Learn how to engage and hit targets from 3 yards out to 300. You will gain the confidence and ability to hit man size targets at distances you may not have shot at before. This is the next evolution from previous LETC courses where the training was 3 yards out to 100. 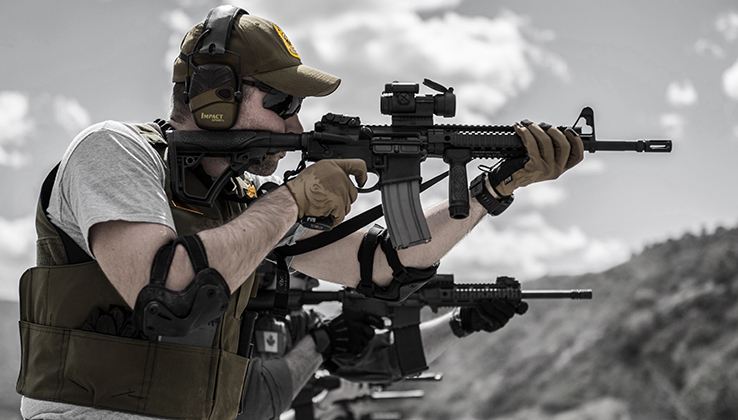 The course will discuss and demonstrate the purpose of a good zero, and will teach you where your rifle and sight combination will hit at extended ranges.This class will take you and your patrol rifle beyond what you may have thought possible. Learn how to engage and hit targets from 3 yards out to 300. You will gain the confidence and ability to hit man size targets at distances you may not have shot at before. This is the next evolution from previous LETC courses where the training was 3 yards out to 100. 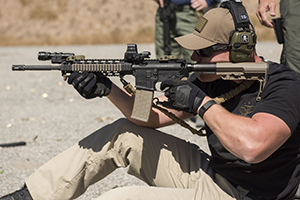 The course will discuss and demonstrate the purpose of a good zero, and will teach you where your rifle and sight combination will hit at extended ranges. Patrol rifle, round count will be minimum of 300, but may be as many as 500, at least 2 magazines. Steve Horsman is a 27-year veteran of the Tempe, AZ PD including 10 years as a SWAT Sniper. Steve is a FTU instructor, USPSA/IDPA/NRA competitor for over 20 years, and one of the authors of the TPD Patrol Rifle Program which has been adopted by numerous agencies. Where do today’s top military and LE units go for firearms training? They go to the competition shooters. Competition shooters understand the importance of speed and accuracy and how to continuously balance the two. 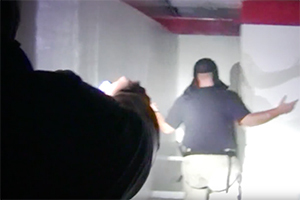 LE firearms training shares many of the same goals as the competition shooter which takes LE Firearms Training to the Next Level. Shooters new to competition can often be overwhelmed with competition rules and philosophies. 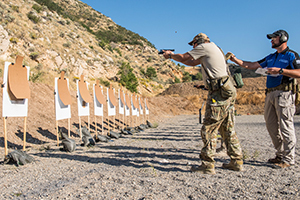 This course will provide the shooters with a chance to experience several different types of shooting competition stages. Then we will discuss how to integrate competition concepts and techniques directly to LE training to move your agency’s training to the next level. Traditional firearms training is great for the new shooter, but is not adequate for the development of high level firearms skills. This course is a blend of lots of shooting stages for the student, discussion, development and implementation of new techniques and a close look at the pros and cons of traditional techniques. Students must be highly proficient with safely shooting, gun handling, and moving around in the range with their unholstered pistol. After some, training students will be expected to run and score other shooters targets as part of the learning process. Eye and ear protection, pistol and holster, at least 3 magazines and 2 mag pouches, 750-1000 rounds of handgun ammunition. Kyle Schmidt is an officer with the Tempe, AZ Police department with over 18 years of experience including seven years on SWAT. He is a firearms SME and is currently a full-time agency firearms training officer. Kyle competes in several shooting disciplines to include USPSA, IDPA, Multigun, NRA Bianchi Cup, NRA Bullseye, and NRA PPC. Has earned several National and World Champion titles through his competitive shooting career. How do you maximize your performance and not let accuracy suffer in a police shooting? Brandon Wright, former state trooper and current member of Smith & Wesson’s professional shooting team helps answer that question. Blending his SWAT experience with competition speed, Brandon understands the needs of today’s police officer. In this class, Brandon gives you the skills to take your shooting abilities to the next level by mastering the fundamentals. He takes a realistic approach to a Police Officers performance in a police shooting and gives you skills and techniques to close the gap between speed and accuracy. Students will learn how to interpret “gun language” through understanding what an acceptable sight picture is and proper trigger management. This will be a high volume round intensive class. Topics will include: acceptable sight pictures, draws and reloads, three types of trigger pull, multiple targets, and close vs. far target engagements. Pistol, holster, belt and magazine pouches, three magazines, 700 Rounds of ammo, wrap around eyewear, brimmed hat, and hearing protection. Brandon Wright comes to LETC as a seasoned firearms and tactical operations instructor with a results oriented, hands on approach. With over 10 years of Law Enforcement experience with the James City County and Virginia State Police Departments, Brandon is a Master Instructor and conducts advanced level firearms and tactical training for senior firearms instructors and tactical teams. Brandon is also an accomplished professional shooter and currently represents Team Smith & Wesson. This brief workshop is specifically designed for the existing law enforcement, private security, military or other professional firearms instructor who requires an enhanced knowledge of the application of diminished light tactics in conjunction with the use of firearms in critical, real-world situations. Additionally, this course is designed to provide a solid understanding of methods of instruction as they pertain to the field of diminished light tactics, firearms, and force application. Eye and hearing protection (clear eye pro for night shooting), 100 rounds of handgun ammunition, handgun, holster, magazine carrier, at least 3 magazines, working handheld flashlight.